An Amtrak train car derailed in Du Pont Washington Monday morning at 7:30 local time and ended up dangling on to Interstate 5 according to the Washington State Department of Transportation. All southbound lanes of the I-5 were closed down due to the derailment. There were multiple fatalities on the train. The Amtrak Cascades 501 was making its first trip on a new service route when the train ran off the track spilling 13 cars off an Interstate 5 overpass onto rush hour traffic below, authorities said. 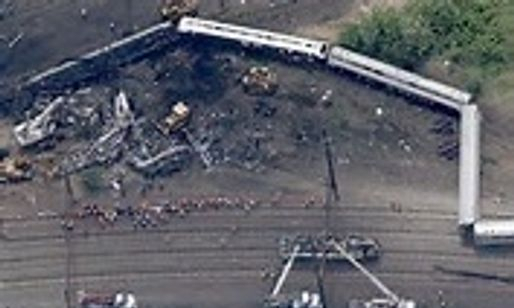 Aerial images show the train sprawled across the track and highway on Monday. The chart of the U.S. surely indicates this terrible event. I use the chart for the signing of the Articles of Confederation. I have generated a triple chart. The inner one is the natal; the middle is the progressed chart; and the outer one is for the transits for the time of the event. Transiting retrograde Mercury (transportation) then was at 14 Sagittarius (fast and adventurous) in the 10th house (in the news, big time), and opposing natal U.S. retrograde Uranus (sudden and unexpected) at 14 Gemini (again, rules transportation) in the 4th. It also ties into the fact that there were 14 cars in the train linkup. The New Moon in Sagittarius a little earlier at 26 Sagittarius squared progressed U.S. Neptune (daydreaming and, or using bad judgement) in Virgo (while working). When the Moon moved up to 28 Sagittarius then, it conjoined the natal U.S. nodes and formed a T-square to natal U.S. Neptune. This reaffirms the last aspect, and tells us that the need for more regulations are definitely necessary. Transiting Saturn in the last degree of Sagittarius was conjunct the 11th house cusp, and opposed the 5th house cusp. Saturn wants to slow things down, while Sagittarius wants to speed them up. The train came to a sharp curve at 80 miles an hour in a 30 mile an hour zone! Three people were killed, and about 100 injured.